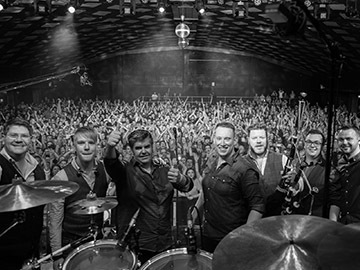 Skipinnish have rocketed to the top of the Scottish music scene recently and their ascent is accelerating! Being named Live Act of the Year at the Scots Trad Awards, releasing four consecutive chart topping self-penned singles, a 3000 seat sell-out concert in the Glasgow Royal Concert Hall that finished with a standing ovation, and a string of headline appearances at some of Britain’s biggest music festivals have been just some of the Highland band’s recent highlights. Skipinnish consists of Angus MacPhail, Andrew Stevenson, Alasdair Murray, Norrie MacIver, Jonathan Gillespie, and Rory Grindlay. Andrew and Angus met while studying at the highly acclaimed R.S.A.M.D in Glasgow. They soon discovered they had a similar passion for authentic traditional Scottish music and by early 1999 ‘Skipinnish’ was established. Since then Skipinnish have never looked back going from strength to strength.